A major doping scandal threw the first Tour de France of the post-Lance Armstrong era into chaos Friday, with favorites Jan Ullrich and Ivan Basso forced out of the world's premier cycling race under a cloud of suspicion. Some in cycling hailed the decision to bar them and other riders implicated in a doping probe in Spain as a breakthrough for efforts to clean up the oft-tainted sport. The scandal could rank as cycling's biggest, given the high profile of the riders and the large number suspected. The Tour, already wide open without Armstrong, will now begin on Saturday with no clear favorite to succeed the Texan who retired last year after his record seventh straight win. The race will also have a reduced field of 176 riders, instead of the 189 originally expected, because teams agreed not to replace those riders being sent home for suspected doping. The scandal, brewing for weeks in Spain, broke open in the space of a few hours in Strasbourg, the starting point for this year's three-week, 2,272-mile trek across France and neighboring countries. Late Thursday night, Spanish authorities sent race organizers more than 40 pages summarizing police investigations. The report accuses a Spanish doctor of providing a slew of performance-enhancing drugs to several of the world's top cyclists, reports CBS News chief investigative correspondent Armen Keteyian. The list includes American Tyler Hamilton, winner of a gold medal at the Athens Olympics — who has repeatedly denied any association with drugs. "They went into this doctor's house, Dr. Fuentes, and found bags of blood in the house, growth hormone, the blood-booster EPO. They found a dossier, a paper trail, with names on it," reports Phil Liggett of the Outdoor Life Network and CBS Sports. The police report implicated nine riders — Basso and Ullrich included — who were signed up for this Tour, cycling's governing body said. Their teams were informed and, with the exception of one squad, all reacted quickly Friday, telling their racers they were out. Ullrich, the 1997 Tour winner, and other members of his T-Mobile squad were heading to a previously scheduled news conference Friday morning when they got word that he, teammate Oscar Sevilla and Ullrich's longtime adviser Rudy Pevenage were implicated. "We kindly asked our bus driver to turn around and go back to the hotel," team spokesman Luuc Eisenga said. The information implicating Ullrich, Sevilla and Pevenage was "clear enough and didn't leave any doubt," he said, refusing to elaborate. Neither Spanish authorities nor Tour organizers released the full report. But Spanish media reports linked Ullrich, Basso and more than 50 other cyclists to Eufemiano Fuentes, a doctor who was among five people arrested in May when police seized banned performance-enhancers at a Madrid doping clinic. Outgoing Tour director Jean-Marie Leblanc said the Spanish investigators cited doping "dosages" apparently prescribed for Ullrich, Basso, Sevilla and Francesco Mancebo, who was also withdrawn from the Tour by his team, AG2R. "We are no longer in the domain of suspicion," he said. "We understood that there was organized doping with these people. There is no question of seeing them at the Tour de France." Ullrich, Sevilla and Pevenage had previously signed declarations that they never had contact with Fuentes. But the Spanish probe indicated otherwise, said T-Mobile spokesman Stefan Wagner. 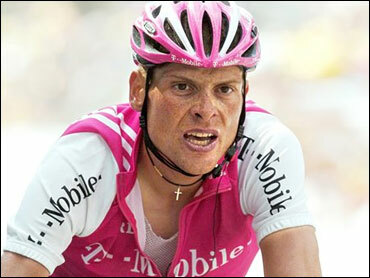 Asked whether T-Mobile would consider cutting ties with Ullrich completely, he replied "certainly ... we are now demanding evidence of his innocence." Ullrich, at age 32 nearing the end of his career, said he was "absolutely shocked." "I could cry going home in such good shape," he said. "I need a few days for myself and then I'll try to prove my innocence with the help of my lawyer. And I'll go on fighting." Basso, runner-up to Armstrong last year, was heading back to Italy, his team said. He had been hoping to become the first rider since Marco Pantani in 1998 to win both the Tours of Italy and France in the same year, having won the Italian race in May. Basso told his CSC team he was innocent. But the team said the suspicion would have made the Italian's participation in the Tour difficult. "It would be big chaos if those riders remain in the race," said his squad manager, Bjarne Riis. "We have to protect cycling." Riis noted that Basso's contract forbids him from working with doctors outside CSC. "Ivan must prove with his lawyer that he is innocent," Riis said. "I believe in Ivan but I have been forced to take the necessary steps." Mancebo, fourth at the last Tour, suggested that he would now retire, said his team manager Vincent Lavenu, who added that he took that to be "an admission" of the rider's apparent guilt. He and others said the scandal could prove a milestone in the fight against doping, not least by scaring other riders away from the temptation of banned performance enhancers. But "I'm not convinced that it's the only network that needs to be dismantled," Lavenu said. The only team that did not react as quickly Friday was Astana-Wurth, which cycling's governing body said had five riders implicated: Joseba Beloki of Spain, runner-up at the 2002 Tour, Allan Davis from Australia; Alberto Contador and Isidro Nozal from Spain; and Sergio Paulinho from Portugal. At Astana, "it looks like a system of team doping," said the Tour's new director, Christian Prudhomme. Finally, on Friday evening, the team said it was withdrawing the five riders. That left Astana with fewer than the minimum six needed to start and forced out the entire squad — including pre-race favorite Alexandre Vinokourov from Kazakhstan. With Basso, Ullrich, Vinokourov and Mancebo out, other riders have greater hopes of succeeding Armstrong as the next Tour de France champion, or at least taking a place on the podium. But no one stands out as a firm favorite in the reshaped field. Americans Levi Leipheimer and Floyd Landis, both former teammates of Armstrong, are contenders. So, too, is Spain's Alejandro Valverde, the 26-year-old whom Armstrong said last year "could be the future of cycling."